Above: Overseen today by the Bureau of Land Management, the Valley of Fires Recreation Area features a visitor center, hiking trails, and campsites. Learn more at nmmag.us/blmvalley. Photography by Charles Mann. A volcano erupted in New Mexico yesterday near Carrizozo—geologically speaking. What is yesterday to geologists is counted as about 1,000 years by the rest of us. Little Black Peak, 15 miles northeast of Carrizozo, erupted in a series of streams of hot black basalt, and when the torrid deluge cooled, it left us with the malpais, or badlands, of south-central New Mexico. 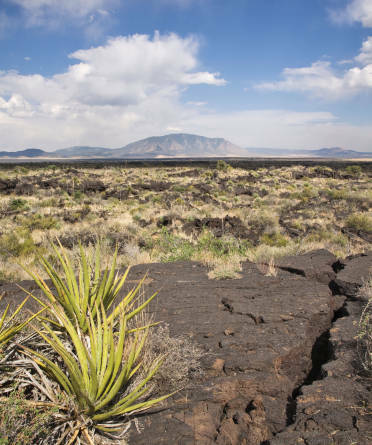 The most recent volcanic eruption in the nation, the black rock stretches for nearly 50 miles through the northern part of the Tularosa Basin. Beneath its crust the naked eye can discern glassy green crystals of olivine.